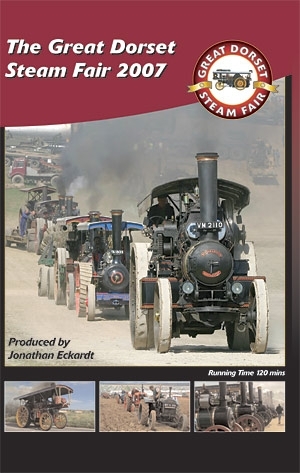 The 2007 Great Dorset Steam Fair DVD is the essential guide to the 39th Show. The wide variety of exhibits, ranging from Working Steam and Organs through the Tractors, Commercial Vehicles and over twenty other working sections, make this programme the definitive record of the Show. Sunshine graced the 700 acre exhibition show ground, this year attracting a record attendance and helping to create perfect filming conditions. This year the Heavy Haulage Arena sometimes resembled Piccadilly Circus with some impressive action captured on film! Boadecia’s might pull, was almost matched by Burrell Showmans Engine, ‘The White Rose of York’, unfortunately spoiled by a loose surface inches from succes. Away from the noise and smoke of the Heavy Haulage Arena we have focused on the variety of rural crafts and pastimes on display in the new Countryside Arena where dancing sheep, Collies and Geese help keep the crowds entertained. Traction Engines on the road travelling to Dorset. A pristine ‘Philadelphia’ making her first appearance after a ten year restoration project. The Hart Parr Tractor Special. The 1907 RAC Steam Tractor road Trials Centenary line-up.